When the bunion deformity is mild, treatment is usually not necessary. However, changing shoes to ones that have little or no heel, and are wider in the toe area (toe box) will be more comfortable and may help to prevent worsening of the bunion deformity. Once a bunion starts to become painful, the recommended treatment depends on the location of the pain. Pain over the medial eminence (bump on the inner side of the big toe) can be treated with a “toe spacer” placed between the first and second toes, as it helps to straighten out the bunion slightly. Pads placed over the medial eminence itself are hard to keep in place and rarely help to relieve pain. Pain underneath the first toe or lesser toes (the ball of the foot) can be relieved by pads placed in the shoes in precise areas. The pads help to take pressure off the prominent areas on the bottom of the foot. Generalized measures to relieve bunion pain, such as physical therapy or foot stretching exercises, have not been shown to be helpful. Orthotics are often prescribed, but are also rarely helpful in relieving pain over the bunion, but may help with pain felt under the ball of the foot. When these above measures no longer help to relieve the pain in the big toe, surgery to correct the bunion deformity is considered. Numerous surgical procedures have been recommended for bunions. What is most critical is that the type of deformity is carefully evaluated, because one bunion surgery cannot be used for all types of bunions. A careful physical examination and evaluation of x-rays will determine what type of surgery will work best to correct the deformity. In each bunion repair, ligaments and tendons (soft tissues) around the big toe joint are reconstructed, to allow the toe to be straightened. Most bunion procedures also require cutting the metatarsal bone, to reposition it back toward its natural place. The bone is then fixed with metal screws or a metal plate to hold the bone in position until it heals. 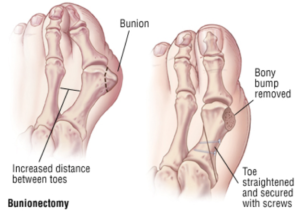 The place where the bone is cut will vary, depending on the type of bunion that is present. Following bunion surgery, the patient is evaluated on a weekly basis for 6-8 weeks, frequently with x-ray examinations, to make sure the bone is healing in the correct position. There is a risk that a bunion will recur following surgery or that it may shift to the opposite direction (hallux varus). For this reason, very close post-operative follow-up is necessary. It takes at least 3 to 4 months to fully recover from bunion surgery, which is why it is always the last course of treatment. Often, some swelling and activity limitations will last for several months more. Surgical time varies between 1-2 hours, depending on what type of surgery is indicated for your foot and whether or not other problems (such as a hammertoe) are addressed. When your surgery has been scheduled, you will be given a pre-surgery packet including information on location of the surgery. The surgery will take place at an outpatient surgical center. Patients over the age of 50 and with certain health conditions will require blood work-up and EKG. Blood thinners should be discontinued prior to the surgery. This includes Coumadin, Plavix, aspirin, anti-inflammatory medicines (ibuprofen, naproxen, Aleve, Motrin, diclofenac, etc. ), glucosamine, fish oil, and herbs that may cause thinning of the blood. If you are on prescribed medicines such as Coumadin or Plavix, meet with your primary care doctor prior to discontinuation. Should you have questions about any particular medicine you are on, please address far in advance. It is also very helpful to schedule a pre-operative appointment about a week prior to your surgery to discuss the surgical procedure in detail and review any final questions you may have. You will be provided with a prescription for pain medicine at the time of surgery or at your pre-operative appointment. If you would like your prescription prior to the surgery and cannot make a pre-op appointment, please contact the office two weeks prior to your scheduled procedure. Stronger pain medicines cannot be called into your pharmacy. Most patients are able to wean off of the pain medicine within one-two weeks of the surgery. We recommend weaning off of the medicine and transitioning to over-the-counter (OTC) analgesics due to the side effects and addictive nature of narcotic medicines. Most of the pain medicine we prescribe contains Tylenol (acetaminophen or APAP). Therefore, Tylenol should not be taken in combination with the pain medicine. It is recommended that you do not exceed 2 grams of Tylenol/day. The pain medicine we typically prescribe contains either 325 mg or 500 mg of Tylenol (APAP). Some comon side effects of narcotics include itching, nausea and constipation. Should you experience these side effects, there are medicines that can be prescribed to counteract them. Because constipation is so common, consider starting and over-the-counter stool softener such as Colace. Maintain a high fiber diet (25g/day for women and 35g/day for men) and stay well hydrated. undergo general anesthesia for this procedure. An ACE bandage is placed on your forefoot following the surgery. It is very important that this be removed 6 hours following the surgery. All other dressings should remain dry and in place. It is recommended that you keep your foot elevated above the level of your heart most of the time for the first 72 hours after your surgery. This will decrease both swelling and pain. Keep dressings dry at all times. For showering, consider covering the splint in a garbage bag, duct taping the edges. You may also obtain a cast-cover, available at the office and at most drugstores. They cost around $28 and are reusable. For most bunion surgeries, patients are permitted to place a small amount of weight on their heel a few days after the surgery in a post-op (stiff-soled) shoe. However, most patients prefer to stay off of their foot for the first 1-2 weeks, using crutches, a walker or a knee scooter. The post-operative appointments following bunion surgery are very important to ensure proper healing of your foot. The first appointment will take place 1-3 days after your surgery, followed by weekly visits for the next 6-8 weeks. At each appointment, the dressing will be removed, and a new one will be applied. It is essential that these dressings are not removed in between appointments, unless the doctor specifically tells you otherwise. You will continue to wear the post-op shoe for the full 8 weeks. X-rays are typically obtained at every other appointment or as determined by Dr. Mann.